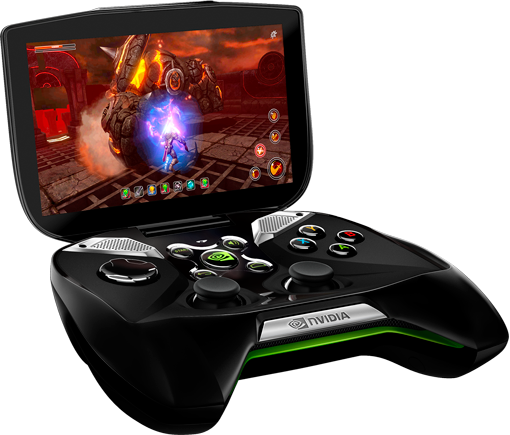 NVIDIA has just recently announced the successor to the company's successful SoC, the Tegra 3, at CES 2013. The new NVIDIA Tegra 4, codenamed 'Wayne', is certainly a very promising SoC, and is expected to push the performance envelope for mobile performance much further. Aside from the SoC, NVIDIA has also announced its first 3G/4G modem, to be used together with the Tegra 4, the Icera i500. To wrap it up, NVIDIA also announced its first ever handheld console, the Project SHIELD, which, apart from introducing a very original and unusual form factor, is also the first handheld console to be able to stream game content from a PC with a GeForce GTX 600 series GPU (or later, I presume). Yes, that means Black Ops 2 on a 5" device. SHIELD can also be used to play games streamed from a cloud game service provider, with the GeForce GRID technology. NVIDIA has announced a real lot of stuff at CES 2013, so let's break it down in pieces, starting with Project SHIELD. In terms of design, Project SHIELD is basically a traditional videogame controller with a 5" display attached in front of it. The display resolution is 1280 x 720 (16:9 aspect ratio), which means that the pixel density should be roughly around the 300ppi range, which is actually very good. Fortunately, the handheld console will have expandable storage with a microSD card slot, and it also has a microHDMI output, for up to 4K display output. there is also a microUSB port on the device, for connecting to a PC and other devices. A 3.5mm audio jack will also be included, for connecting headphones, and, apart from Wi-Fi, connectivity options for SHIELD include Miracast. NVIDIA says that Project SHIELD is running "pure Android", which presumably means that we'll see completely stock Android OS, without any OEM customizations. SHIELD can actually also act as any normal android device, given that it runs the full Android OS. NVIDIA's TegraZone app distinguishes itself by displaying games specifically optimized and enhanced for NVIDIA hardware, and hence improving (at least visual) gaming experience compared to its competitors. TegraZone will now also contain games that are specifically enhanced for the SHIELD. NVIDIA is also using an app, similar to splashtop, to enable streaming of content from GeForce containing PCs to the SHIELD. This will be only possible if you have a GeForce GTX 600 series GPU, and, as I assume, all future iterations of the GeForce series. This can be very helpful for gaming on the SHIELD, because, like in splashtop, what happens is that all rendering is done by the PC's graphics card, streamed to the SHIELD, where the display is mirrored from the PC to the SHIELD. This means that you'll be able to play some very advanced games on the SHIELD, actually, pretty much any PC game can be played from the SHIELD. How would you like to play Black Ops 2 on the SHIELD? Like any other Android device, the SHIELD can also stream games from cloud-based gaming services, which should also be nice. NVIDIA says that the SHIELD will be released in Q2 2013, and its pricing will be competitive compared to existing handheld consoles and tablets. Of course, one of the main ingredients for good gaming experience is performance. Given that the SHIELD is intended for gaming, NVIDIA needed to optimize the gaming experience with some excellent performance, while keeping power consumption low enough for mobile standards. Well, considering that the SHIELD will be powered by the brand new NVIDIA Tegra 4 SoC, I'd say that performance won't be a concern or a limitation for the SHIELD. 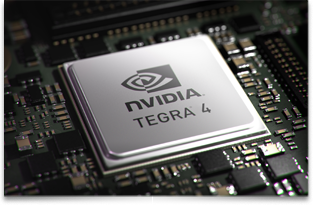 The NVIDIA Tegra 4 is by far the largest leap the Tegra series has ever made. For starters, it fortunately optimizes thermals and improves power efficiency dramatically by moving from Tegra 3's (and 2's) 40nm process to a much more current 28nm HPL (28nm Low Power with High-K + Metal Gates). NVIDIA recycled and updated the 4-PLUS-1 CPU architecture used in Tegra 3. The CPU gets a very big architecture upgrade from the last-gen Tegra, since the CPU moves from a quad-core Cortex-A9 design to a much more efficient quad-core Cortex-A15 design. The companion core, which is a low power core, optimized for handling light workloads using very little battery, is now another regular Cortex-A15 core, just with very limited clock speeds. Clock speed also receives a bump, and is now up to an impressive 1.9GHz. The companion core is completely invisible to the OS and Apllications. NVIDIA also finally decided to make an acceptable memory interface, this time opting for a maximum of two 32-bit DDR3L channels, on par with the Samsung Exynos 5250 and the Apple A6X. The GPU on the Tegra 4 is what gets the biggest bump. We still don't have any details on GPU architecture, but what we know is that the GPU core will consist of 72 shader cores, up from 12 cores in the Tegra 3. This is quite an impressive bump, and without any architecture and clock speed modifications since the Tegra 3, should result in 72 GFLOPS peak theoretical performance, almost certainly better than the Mali-T604 in the Exynos 5250 and almost on par with the Apple A6X's 77 GFLOPS capable PowerVR SGX554MP4 GPU (a little bump in clock rate would easily get the Tegra 4 past the A6X, and that is if the architecture remains unchanged). The new SoC will also enable for output to 4K displays, or output of 1080p content @ 120Hz, and will also enable for 1440p (2560 x 1440) video decode. Taking pictures will also improve a lot with the Tegra 4, given that the chip's ISP (Image Signal Processor) will use Super Speed Imaging to dramatically improve picture-taking. For the first time in Tegra history, the new Tegra 4 will be able to be implemented with an Icera i500 Soft Modem, owned by NVIDIA, which will finally enable for Tegra 4 to be used in 3G/4G LTE enabled devices. Looks like Qualcomm has just lost its major selling point. At any rate, we shall soon see how this amazing looking SoC fares among the existing SoC competition, and we'll see whether it survives the onslaught of competition arising together with it.